Using a height predictor or height calculator can help give you a general idea of how tall your child will grow up to be. See, there are specific height predicting formulas out there that offer reasonable estimates. Of course, your child’s future height depends on several factors, including genetics, their height during childhood, and gender. Can I accurately predict my child’s adult height? • Convert the mother and father’s height into either inches or centimeters, and add these two numbers together. • If your child is a boy, add 5 inches (13 centimeters). If your child is a girl, subtract 5 inches. • Divide this value by two. What types of online height calculators are available? There are several available online that can be found with a simple Google search, such as this one. You can enter the child’s age, in terms of years and months, their gender, current height and weight, as well as the mother’s and father’s height. The result will be your child’s predicted height at age 18. 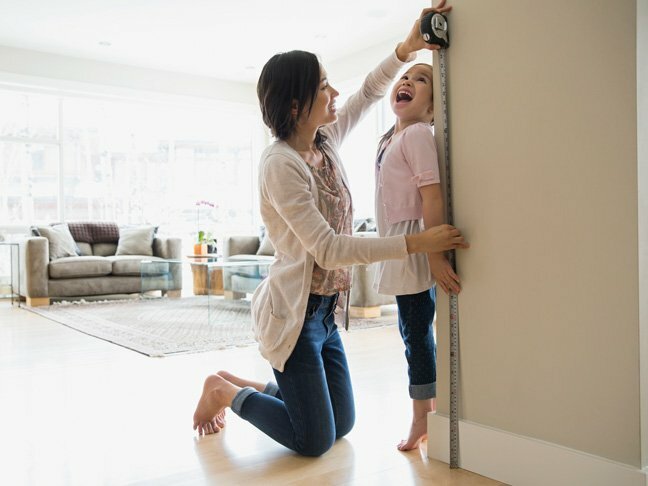 What other methods can I use to calculate my child’s future height? Another popular method involves doubling a boy’s height at age 2 or doubling a girl’s height at 18 months. Are boys generally taller than girls? Boys start growing later than girls but enter puberty earlier. A boy’s growth spurt typically comes near the end of puberty, not at the beginning as it does for girls. This gives them the advantage of two extra years of normal childhood growth before hitting their peak. On average, adult men are about 5 inches taller than women. Boys also grow faster than girls at their peak rate, near the end of puberty, because of higher levels of testosterone in their blood, which initiates growth of cells all over their body — skin cells, bone, muscles, and so on. What will determine how tall my baby will be? While several online child height predictors can be useful, height is really determined by genetics. If you and your husband are tall, your child is likely to be as well. Nutrition, medications, and hormones will also be determining factors. And remember that every child grows at a different rate. Many are late bloomers, while others hit their growth spurts early. Parents should take any information that a height predictor provides with a grain of salt — while they may be accurate to some degree, there’s no surefire biological way to predict a child’s future height at age 18. However, parents can have fun wondering and making predictions with online height calculators.